You didn't forget doing it mate, I also ticked the box last week or the week before. It reset for some reason by the looks. I only noticed because I check boincstats daily and saw no credits and a strange abbreviation next to LHC. Unbelievable!! After first seeing that LHC now needed consent to export stats I went and selected the appropriate box and I thought that was that. Heck I even started a thread to show new GDPR projects as they come up. 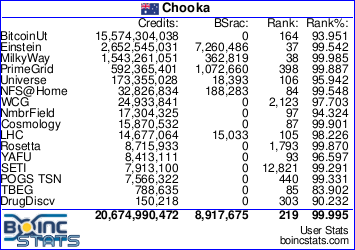 But I just found out that my name is missing on boinc-stats for LHC. So I checked once more and low & behold the setting is now not selected. What went wrong? I'm buggered if I know? I wonder what else i've missed? It makes you wonder how rank & file members are coping with this crap, most of whom would never have even heard of GDPR? Thanks for reminding me chooka. Yes, the whole thing is a mess. I saw LHC lost 12 billion yesterday in the BOINCStats morning update and regained a bunch again in the next one. One day I gain thousands of positions and then I lose thousands. One day I was in the top 100 at LHC. Heck, I have run less than 200k there. Do not forget NumberFields which will implement it in the next few days. This surprised me. Not sure why the University of Arizona cares. None of the CA universities have done anything. Also there is no standard place where they put the option; some global and some in the generic profile. Does this mean one has to set it in each profile being used? We have been doing this for decades and we get confused. God help "Debbie Doe" who is trying to save the planet on her little pink laptop. BOINC is the overall loser.